Cianbro is the latest company to take advantage of the barge-mounted benefits that Manitowoc crawler cranes with Variable Position Counterweight (VPC) offer. Cianbro is the latest company to take advantage of the barge-mounted benefits that Manitowoc crawler cranes with Variable Position Counterweight (VPC) offer. 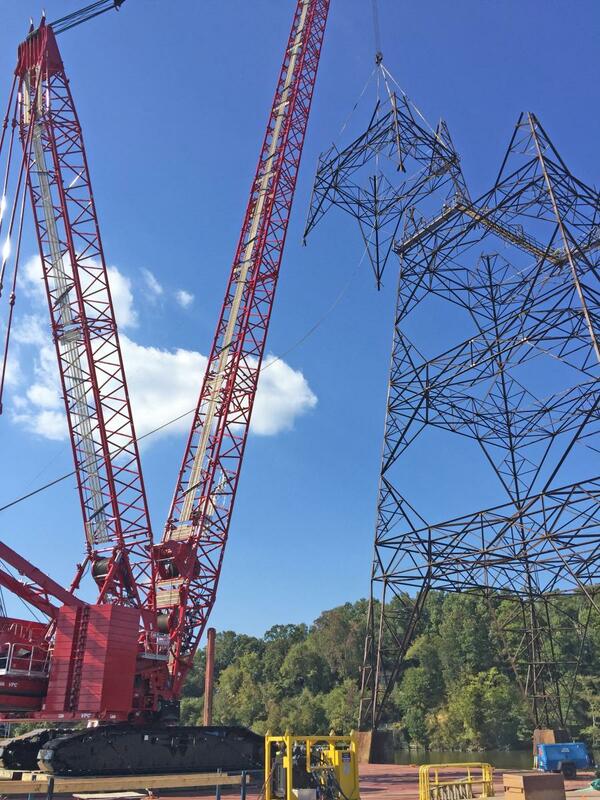 The Pittsfield, Maine-based construction firm is using a Manitowoc MLC650 to help replace two aging transmission towers on the James River near Charles City, Va. The new towers will help feed energy from a nearby nuclear plant to the surrounding area when construction is completed. The two towers stand 425 ft. tall, rising from the James River. While planning the project, it became clear that a barge-mounted crane would provide more efficiency, as the crane could complete lifts in closer proximity to the transmission towers. Previous generations of crawler cranes that would have been used to get the reach and capacity needed for the job may have been too large for erection on a barge. But the MLC650 with VPC-MAX has the reach and capacity in specialty barge charts to get the job done. 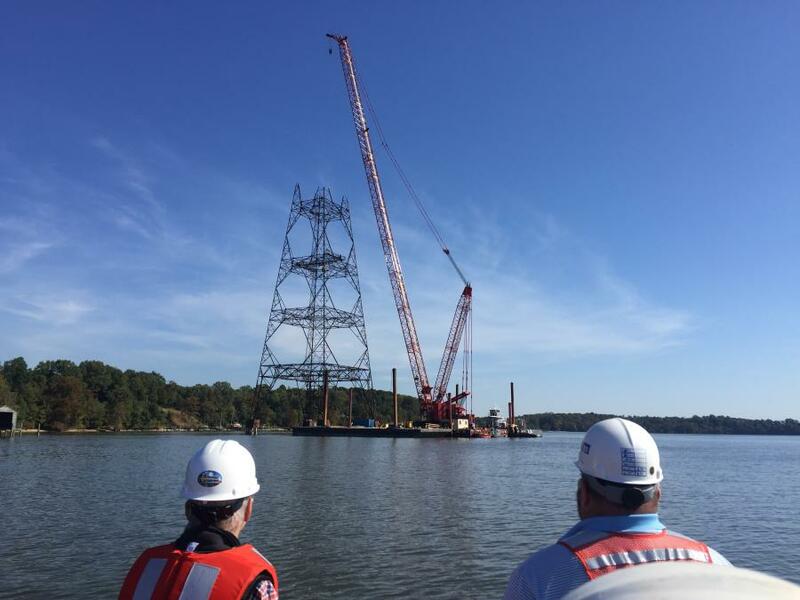 Cianbro's MLC650 is erected on a Poseidon P10 portable sectional barge, which measures 132 by 132 ft. Once the crane removes the old transmission towers, it will then set the replacement towers into position on the river. The heaviest components of the new towers are their 100 by 90 ft. bases, which weigh 75.5 tons and will be lifted to a height of 10 ft. The upper halves of each tower weigh 28 tons and will be lifted 435 ft. above the water for installation. To dismantle the old transmission towers and erect the new ones, the MLC650 is outfitted with the VPC-MAX attachment, which enhances the crane's capacity and enables additional boom- and jib-length combinations. Each tower section will be assembled at Shirley Plantation on the north bank of the James River, 9 mi. away from the construction site. Once completed, the sections will be moved into position by barge, where the MLC650 will install each one. The MLC650 isn't the only Manitowoc crawler on the job. An additional, barge-mounted Manitowoc 4100 RINGER will assist the MLC650 with lifting each tower component. Two Manitowoc 4100Ws and a 4000W also are set up on the river bank to remove old tower components from the river and to deposit them on land for further disassembly. Cianbro received the MLC650 from Shawmut Equipment, a Manitowoc crane dealer that has served New England and the Atlantic provinces of Canada since 1957. The tower replacement project is being overseen by PAR Electric, which brought Cianbro onboard as a subcontractor. The Kansas City-based company is one of the most respected outside plant electrical contractors in North America, handling some of the biggest large-capital transmission, distribution and substation projects in the region. Cianbro was founded in 1949 and has since grown into one of the largest employee-owned construction companies in the United States. The company operates in more than 40 states, specializing in civil, structural, mechanical, electrical, instrumentation, fabrication and coating projects. The transmission tower replacement began in August of 2017 and is on schedule for completion in February of 2018.